(c) one part of the material may yield in compression more readily than others owing to some lack of uniformity in the material properties throughout the strut. At values of load below the buckling load a strut will be in stable eqilibrium where the displacement caused by any lateral disturbance will be totally recovered when the disturbance is removed. At the buckling load the strut is said to be in a state of neutral equilibrium, and theoretically it should then be possible to gently deflect the strut into a simple sine wave provided that the amplitude of the wave is kept small. This can be demonstrated quite simply using long thin strips of metal, e.g. a metal rule, and gentle application of compressive loads. Theoretically, it is possible for struts to achieve a condition of unstable equilibrium with loads exceeding the buckling load, any slight lateral disturbance then causing failure by buckling; this condition is never achieved in practice under static load conditions. Buckling occurs immediately at the point where the buckling load is reached owing to the reasons stated earlier. 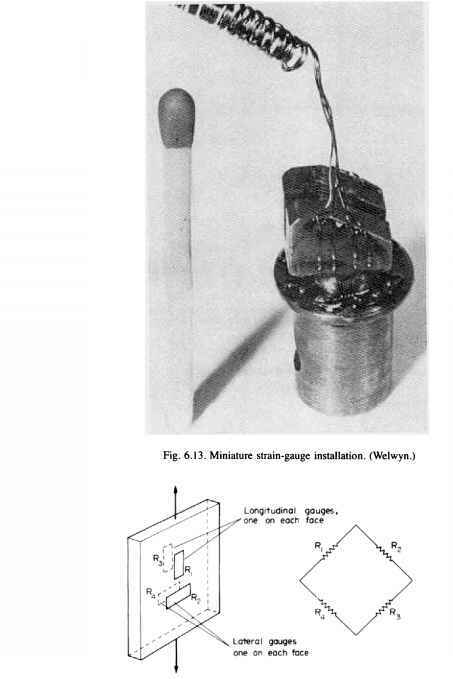 The above comments and the contents of this chapter refer to the elastic stability of struts only. It must also be remembered that struts can also fail plastically, and in this case the failure is irreversible. Consider the axially loaded strut shown in Fig. 2.1 subjected to the crippling load Pe producing a deflection y at a distance x from one end. Assume that the ends are either pin-jointed or rounded so that there is no moment at either end. Fig. 2.1. Strut with axial load and pinned ends. The solution chosen of nL = n is just one particular solution; the solutions nL — 2n, 3tx, 5n, etc., are equally as valid mathematically and they do, in fact, produce values of Pe which are equally valid for modes of buckling of the strut different from that of the simple bow of Fig. 2.1. Theoretically, therefore, there are an infinite number of values of Pe, each corresponding with a different mode of buckling. The value selected above is the so-called fundamental mode value and is the lowest critical load producing the single-bow buckling condition. The solution nL = 2n produces buckling in two half-waves, 37T in three half-waves, etc., as shown in Fig. 2.2. If load is applied sufficiently quickly to the strut, it is possible to pass through the fundamental mode and to achieve at least one of the other modes which are theoretically possible. In practical loading situations, however, this is rarely achieved since the high stress associated with the first critical condition generally ensures immediate collapse. The buckling load of a strut with pinned ends is, therefore, for all practical purposes, given by eqn. (2.1). Fig. 2.2. Strut failure modes. Consider now the strut of Fig. 2.3 with the origin at the fixed end. The particular solution is a particular value of y which satisfies eqn. (2.2), and in this case can be shown to be y — a.